Portland, OR, USA, June 13, 2014 — The IntelliCAD Technology Consortium (ITC) today announced the release of IntelliCAD 8.0. Available in both 64-bit and 32-bit versions, IntelliCAD 8.0 opens, saves, and creates .dwg files, including the latest 2014 file format. New features include layer states, layer filters with search, layer transparency and viewport freeze, .cui custom menu files, quick select, 3D orbit, additional grid capabilities, Collada (.dae) file import, MrSID MG4 compressed raster image support, and more. In addition to core computer-aided-design (CAD) features, IntelliCAD is a development platform on which member companies develop custom applications. IntelliCAD 8.0 includes several API enhancements including updates to Open Design Alliance (ODA) Teigha® version 3.9.1 and support for VBA 7.1. ITC members also now have access to source code for advanced rendering and image processing components. Portland, OR, USA, July 5, 2013 — The IntelliCAD Technology Consortium (ITC) today announced the release of IntelliCAD 7.2c. IntelliCAD 7.2c is a maintenance release that contains over 200 improvements and fixes since the IntelliCAD 7.2b release two months ago in May 2013. In addition to fixes, improvements can be found in the areas of performance, multiline text, selection, entity snapping and tracking, and an update to new ACIS libraries. ACCA Software, member of the ITC, announced the release of PriMus-TO based on the IntelliCAD 7.2 engine. ACCA's new software opens, without conversion, .dwg and .dxf files produced with other CAD software and graphically quantifies entities and blocks contained in the drawing. The metric information is acquired automatically and the aggregation of graphical entities to price list items and formulas creates a single element in which design and BoQ are linked together. For more details, see http://www.accasoftware.com. IntelliCAD 7.2 contains many new features and improvements to areas required by members and their users since the IntelliCAD 7.1a maintenance release in January 2012. IntelliCAD 7.2 achieves new benchmarks in performance with support for OpenGL that enhances dynamic pan, zoom, redraw, and rotation, especially for large files, but also internal improvements for large drawing files, including editing, dynamic dragging, gripping, display, and snaps. With over 600 fixes since the 7.1 release, IntelliCAD 7.2 additionally includes many new features: .NET application support, find and replace text, import .dgn files, insert underlays, work with Collada (.dae) and MrSID (.sid) files, and receive alerts in a new Notification Manager. New entity snap features include: entity snap tracking, Parallel Snap, From Point, Temporary Tracking Point, and Midpoint Between 2 Points. Enhanced existing features include selecting by filter (including proxies), managing layers at the command line, clipping layout viewports, and more. 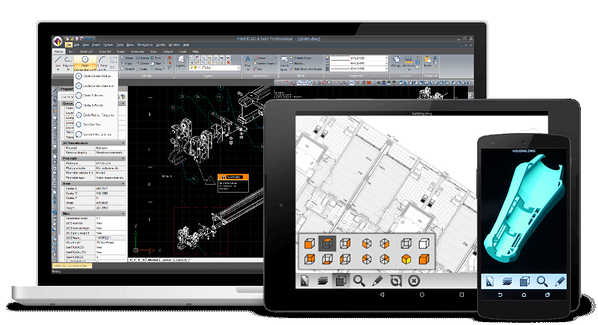 IntelliCAD 7.2 integrates the most currently available Open Design Alliance Teigha® version 3.5.1. David Lorenzo, ITC Development Director commented, “The new architecture of the IntelliCAD 7 series is proving its merit as more ITC members adopt and integrate it with their own vertical solutions. Brought by members to CAD industry users, forward-moving IntelliCAD 7.2 delivers value and expertise with added features, increased performance, and fixes." Portland, OR, USA, January 31, 2012 — The IntelliCAD Technology Consortium (ITC) today announced the release of IntelliCAD 7.1a. IntelliCAD 7.1a is a maintenance release that contains over 250 fixes and performance improvements to areas required by members and their users since the IntelliCAD 7.1 release in November 2011.